Bencharong ware is a polychrome porcelain made in the city of Jingdezhen (the porcelain capital of China) and richly decorated to Thai tastes with bright enamel glazes. It is thought that Buddhist books and paintings were supplied as references and sent to Guangzhou merchants, who acted as intermediaries to the Chinese potters and decorators for foreign orders. As with Western orders, new, alien ceramic shapes were communicated by maquettes in wood or perhaps metal. While the name Bencharong derives from the sanskrit words ‘pancha’ and ‘ranga’ meaning five colours, Bencharong wares can also be found with as little as three and as many as eight colours. 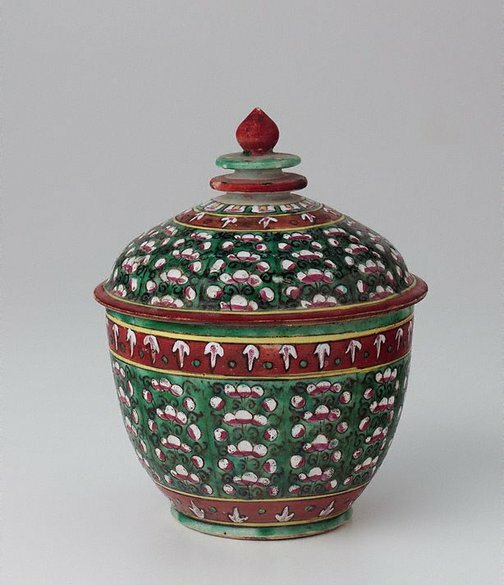 This 'toh' jar is designed to hold water and is decorated with vertical bands of lotus buds known as the ‘Lai phum khao bin’ motif.